1. Great Limpopo Transfrontier Park: A massive swath of land that comprises national parks in Mozambique, South Africa, and Zimbabwe and allows visitors to cross the borders freely within the park, Limpopo is home to nearly 150 kinds of mammals, including elephants, giraffes, and buffalo. 2. Gorongosa National Park: This once legendary park in northern Mozambique was nearly destroyed during the country�s civil war. Now newly refurbished, it�s returning to its former preeminence and is worth a visit to check out impalas, warthogs, unusual birds, and more. 3. Local Fare: In Maputo, feast on some of the ultrafresh seafood caught off Mozambique�s 2,500-kilometer-long coastline; the grilled prawns and octopus are especially good. 4. Montes Chimanimani: Along the Zimbabwe border, this mountain range, thick with pine and mahogany trees and scores of medicinal plants, is ideal for rugged, off-the-beaten-path hiking and camping. 5. Ilha de Mo�ambique: This tiny island off Mozambique�s northern coast was once an important Arab trading port; today its historic, colonial-era buildings and diverse population, with strong Islamic and African ties, makes it a fascinating place to explore. 6. Archipelago das Quirimbas: These 32 islands off the town of Pemba, which can be reached by motorboat, offer white-sand beaches, snorkeling among coral reefs, and sightings of humpback whales. 7. Ponta de Ouro: Just miles from the South African border in southern Mozambique, this quaint town boasts some of the country�s loveliest beaches and opportunities to scuba dive among dolphins. 8. Lago Niassa: A giant, incredibly clear lake that borders Mozambique, Malawi, and Tanzania, Niassa (also known as Lake Malawi) is thought to contain a greater number of fish than any other lake in the world. 9. Angoche: A quiet, historic town in the northern part of the country that still bears the influence of precolonial Swahili and Arab traders, Angoche is worth a quick trip for a look back in time. 10. Manica: Once an important gold trading area, this picturesque town in central Mozambique is now known for its thousand-year-old Chinamapere rock paintings, which are considered sacred by local residents. The best time to visit Mozambique is between May and October, when it�s pleasantly sunny and dry and temperatures average 66 degrees Fahrenheit (18.3 degrees Celcius.) The country�s rainy season generally lasts from October to April, with temperatures jumping up to the 80s (20s.) Overall, the southern part of the country is cooler and drier than the north. 1- If you can it's advisable to GET A VISA BEFORE ARRIVING; getting a visa at the border is not as easy as it once was - it�s not worth the risk of being turned away. Generally genuine tourists are not having a problem getting visas at the border, people coming to hope to find work, be warned! 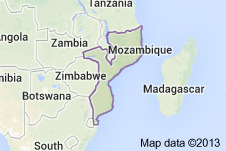 9- MANAGE YOUR EXPECTATIONS, Mozambique is at the foot of UNDP�s development index and is growing after the decades of wars ended in the 1990s. The country has its magic but staff in restaurants and hotels are often poorly trained and infrastructure in general is still lacking. Most everything is more expensive than travelling in neighbouring countries like South Africa and Malawi. In short, come with plenty of cash, and patience. 10- If you are a visitor from South Africa make sure you DRINK CHEAP MOZAMBICAN RUM WITH PINK SPARLETTA, they might not let you back home if you don�t (this will make more sense once you get to one of the beaches with many South African guests). Maputo � The Mozambican government has approved a decree creating a new integrated tourism resort in the northern province of Nampula. The new tourism zone covers the Crusse and Jamali islands in Mossuril district, and the adjacent area of the mainland, covering a total area of 1,750 hectares. Crusse and Jamali had already been earmarked as an "area of tourism interest" in a government decree of 2010. Speaking to reporters on Tuesday, at the end of a meeting of the Council of Ministers (Cabinet), the government spokesperson, Deputy Justice Minister Alberto Nkutumula explained that the creation of this zone is intended to help create poles of development in areas with the potential for developing integrated projects, particularly in the hotel industry and tourism. The idea, he said, was to build luxury hotels, and complementary units such as a marina, a casino and an 18 hole golf course. There would also be an area for "residential tourism". "The vision is to transform the area of Nacala, Mossuril, Matibane, Crusse and Jamali into one of the most attractive zones for luxury tourism in the world", said Nkutumula. The two islands are uninhabited, but about 3,600 people live in the mainland area covered by the tourism zone. "In principle, a resettlement plan will be drawn up for these people", Nkutumula said, stressing that local communities will be involved in the tourism projects. A tourism operator for the entire area will be chosen through an international public tender. Every list of Africa's best beaches should include The Seychelles, Zanzibar and Mauritius. These islands in the Indian Ocean are home to literally dozens of picture-perfect beaches. But my pick for Africa's best beaches, below, stick to the rule of one beach per country. Countries like Eritrea and Somalia have beautiful unspoiled beaches too, but they are not easy destinations for travelers to get to and I am personally not familiar enough to recommend them. Mnemba is a private island in the Indian Ocean and part of the Zanzibar Archipelago. The island offers the best snorkeling in Zanzibar (and that's saying something) and you can also watch whales, see dolphins and swim with whale sharks. Best of all, for the romantics out there, there are only 10 cottages on the island which make up the Mnemba Island Lodge owned by luxury travel company &Beyond. Each cottage has its own veranda and is hidden in the shade of a tropical beach forest. Budget Alternative: Nungwi on the North Coast of Zanzibar or Mafia Island.